Old habits are hard to break. And, while apple farmer Stan Devoto has long been aware of the benefits of organic farming, it wasn’t until recently that the veteran farmer began to consider a change. Stan and his wife Susan have been farming flowers, a wide range of apples, and persimmons on Devoto Gardens’ 20 acres in Sonoma County for 33 years. “Things were working okay, so I didn’t see the need for a change,” he recalls. But that’s not how his three daughters Christina, Jolie, and Cecily saw it. “They said, ‘Dad, you’re behind on the times, you’re a dinosaur, it’s the right thing to do,’” says Stan. The Devoto girls were concerned about the farm’s environmental impact, but also about the health of their family. “They said they didn’t want to live here if I was going to be spraying synthetic poisons around the house,” he recalls. Stan and Susan did some research into what exactly it would take to become certified, and they decided to give it a try. Because organic certification requires that farmland be free of all synthetic pesticide, herbicide and fertilizer for 3 years, the Devotos, like many transitioning farmers, feel like they’re in a kind of limbo. “There is no way to prove you’re in transition. 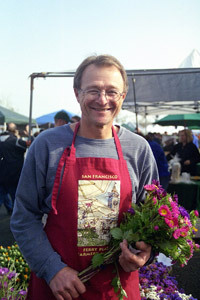 You’re not organic, but you’re not conventional grower anymore either,” he says. In other words, transition means all the work of organic without being able to command the price for certified produce. During this lag time, Stan has found organic solutions to battling the diseases, scabs and mildews that might blow onto his property from surrounding apple orchards. He’s also had to develop new organic ways to strengthen the soil. But there’s a light at the end of the tunnel; after one more year, a lot of paperwork, some fees, and an in-depth inspection process, the Devotos will be set to offer certified organic apples. In addition to an expanded wholesale market, Stan hopes he might also be able to sell more of his organic windfall apples, the fruit that is not suitable for packing. “They have great flavor but they might be scabbed, bruised or partly eaten by a worm (more worms are to be expected when you’re growing organic),” he says. 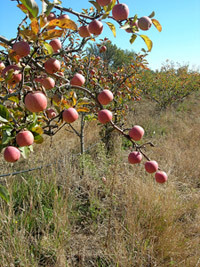 Windfall apples are allowed to drop to the orchard floor and are gathered once or twice a week to be used for juice; they also make up around one third of Devoto’s crop. In recent years, the farm hasn’t had a market for most of these apples, as an abundance of apple juice concentrate from China, as well as from other regions of the US, has drastically reduced the market. (See a recent article in the Santa Rosa Press Democrat). As standardized as organic certification has become under the USDA, it’s worth noting that farmers’ reasons for making the switch still vary quite a bit. In Stan’s case, the financial risk, hard work, and time spent in limbo is all — at the core — an investment in his family. “It’ll be great if they can take over the farm when I’m ready to retire,” he says. Apple orchard photo by Alisonandjoel.